I bet you didn’t even know that there was such a thing as a sofa bed for everyday use did you? To be completely honest with you, neither did I. Until I found Furl sofa beds of course. Sofa beds really aren’t commonly associated with every day sleeping. So I don’t think many people realise that they do actually exist. Only when you have visited the Furl Showroom and tested our sofa beds, will the term sofa bed for everyday use actually make sense! But how do you actually choose a comfortable sofa bed for everyday use? It will involve a lot of trial and error. As you are completely right when you sit there thinking that comfortable is subjective. What I like to sit on you might not. What you like to sit on I might not. The mattress I like to sleep on you might not…you get the gist. And that is why at Furl, we have such a choice. As choice allows you to find a sofa bed that is right for you. Remember that all of our sofa beds at Furl are designed for everyday use. So you are just choosing the one that you find the most comfortable. 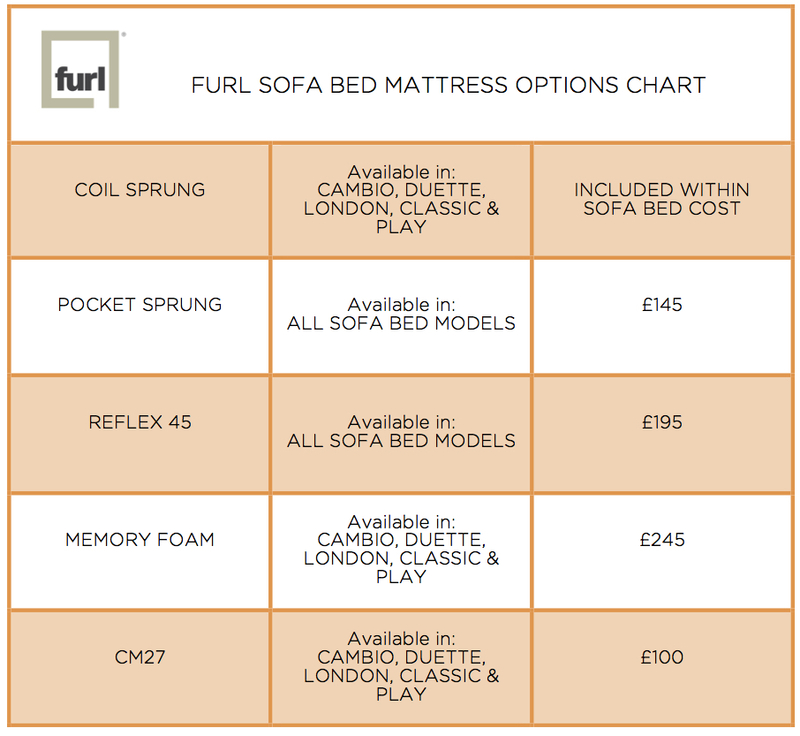 At Furl, we have eight different sofa bed models. You might have heard them referred to as Cambio, Duette, London, Classic, Play, Vasca, Milano and Retro. They all have different back heights, seat depths, seat angles, arm widths and their seat fillings vary slightly too. The Cambio, Classic, Play and Retro all have foam filled seat and back cushions. They are both firm and supportive. All models vary in their feel due to the angles of the seat cushion and height of the back cushion. So although they have the same filling, they do feel different to sit on. The Vasca, Milano and London Models have fibre filled seat and back cushions. Fibre has a little more movement than foam and so the cushions feel a little softer and more squidgy, whilst still retaining their shape. The Duette Model has a very slim layer on feathers in both the cushion seat and back. These soften the feel of the cushion, but do not need any plumping. In order to find out which sofa you feel most comfortable sitting on, you really just need to sit on them. Quite simple really! Our showroom in Wembley opens by appointment, of which are available to book on our website. Most of the sofa beds are at the showroom to test, however if you are coming to see a specific model, please do get in touch with us in advance of your visit. All of our sofa beds come with a variety of different mattress types. This is again as comfort is subjective, and you want to find the mattress that is the most comfortable for you. Here a list of all of our sofa bed mattress options, what sofas they are available in and what their price is. *Tip – Remember that price means nothing when it comes to mattresses. The most expensive is not the best. The best is the one that you find the most comfortable. The price simply determines the cost of the materials used to make the mattress, and not its quality. Just like the actual sofa, in order to find out which mattress you feel most comfortable lying on, you really just need to lie on them. Again, super simple! Once I’ve chosen the most comfortable sofa bed for me, what happens next? Once you have the sofa model and mattress type selected, the next thing to do is to choose the fabric. As all of our sofa beds are made to order, so you select exactly which fabric type you would like to have – including real leather. There are 1000s of different colour options, and if you still can’t find a fabric you would like to use, then you can also supply your own. When the fabric is selected, this is then when you are ready to place your order. Just before placing your order, you need to check that the sofa bed will actually fit within the room. We have 5 different sizes, and each of those size options can come with varying arm widths. You are purely measuring the space your sofa bed will actually sit, not the access to that space. 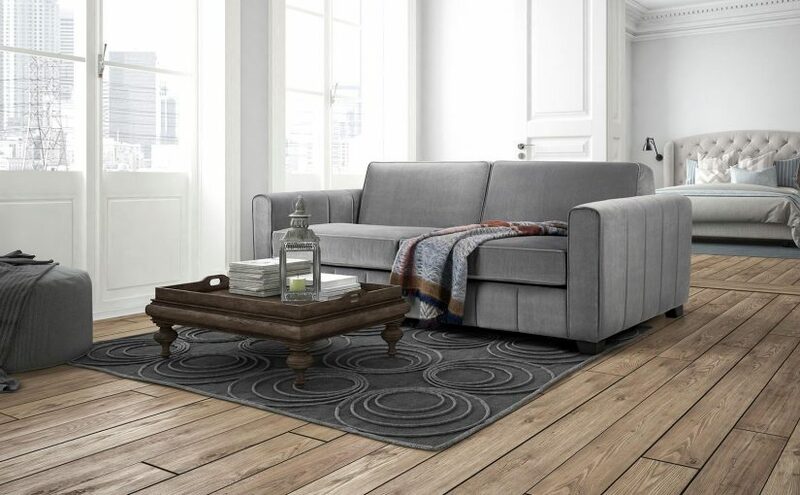 If you select our ‘Home Installation’ option, we will deliver the sofa bed into the room in complete pieces. We then assemble it in the room for you. Our general rule is that if you can fit in to the room without having to bend, twist or duck, then the sofa bed can too. But if your space is really really tight, then please do get in touch, and we can help check that it will definitely fit before ordering! You’ve ordered your sofa bed for everyday use – Congratulations by the way – now what happens? Our sofa beds take around 8 weeks to make. Although a member of the Furl team will be in touch via email around 7-10 days prior to arrange delivery. We have our own in house delivery team, and so they will know exactly how to assemble the sofa bed when they arrive with you. Once the sofa bed is assembled, we will remove all the packaging and take it away with us, and your sofa bed for everyday use is ready to use! If you would like to read more about our Sofa Beds, we were recently published in Real Homes Magazine. They wrote an article on 10 of the best contemporary sofa beds and our Vasca model features in it. Previous Previous post: How big is an emperor size bed?